In part one of this post I emphasized how important scientific literacy is to the continued viability of our representative form of government. It’s not really representative if we as citizens are not informed enough to tell Congress how they should formulate policies on energy, food supply, medicine, scientific research and development, and other issues that require an understanding of basic scientific concepts. If we are to have any say in deciding what is right for us both as individuals and as members of a larger society—and not just what the moneyed interests would have us believe—then we have to be able to sort through the facts ourselves. Now, if you are anything like me, the amount and quality of scientific knowledge that you acquired in high school was incomplete at best. Hardly enough to fully comprehend the concepts behind many of the science related issues mentioned in headlines and debated in Congress. The good news is that there are plenty of inexpensive resources available to help anyone become scientifically literate. By scientific literacy I mean being familiar enough with vocabulary and concepts to understand the news of the day as it relates to science. 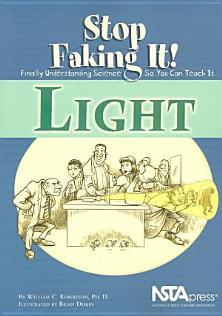 Elementary Science Textbooks: As a father, I was exposed to the elementary and middle school science books that my children brought home from school. Most of these are nothing like the rather dull tomes from my childhood. They are generally well written, organized and illustrated. If you know absolutely nothing about science or a particular scientific field, these science text books are a very good place to start. I still keep several on my bookshelf to help me review and explain scientific principles. However, these types of books do have one major downside. In an effort to convey scientific concepts in the simplest of terms, they often omit important details. For example, school texts often say that light always travels in straight lines. It is true that light always takes the shortest route from one place to another, and this is usually a straight line in a three-dimensional universe. However, when we take into account Einstein’s generally accepted theory of four dimensional space (time + height + width + depth), we find that the shortest distance between one place and another is a curved path. Thus, if you want to get to the heart of a particular concept you have to move on to science books for young adults and/or introductory texts for adults. Children’s Books: The books and videos available in the children’s section of your local public library are a natural extension of school text books. This is my starting point when I need a crash course on a topic I know very little about. Almost everything is covered in basic terms and well-illustrated, from the principles of electricity to the biology of sharks. In addition to covering a wide range of topics, the children’s section often offers an assortment of books designed for young adults. The best of these go well beyond the simplistic explanations found in school texts while remaining quite easy to follow. One good example is a five-volume series for young adults called Secrets of the Universe. These books offer a relatively in-depth examination of the laws of physics that govern the universe in a very clear, comprehensible and illustrated manner. Made-Easy Guides: An adult interested in learning just about any subject will almost immediately come across a volume in the For Dummies, Idiot’s Guide or Made Simple series. These can be quite helpful. 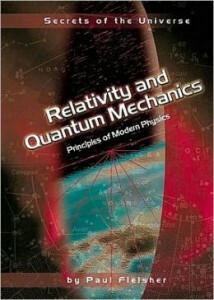 They offer a relatively in-depth survey of a topic without a lot of jargon or advanced mathematics. However, some of these are not as basic as they might let on. Moreover, they often include few examples and lack illustrations. This is the place to start if you already know a bit of science or want to review a topic that you have some familiarity with. The Great Oracle: By now, you’ve probably begun to wonder why I haven’t mentioned the one place where you can find information on just about every subject known to man. The short answer is that it takes a lot of time to find a webpage that provides the information you need in a way that is easily comprehensible. You are much more likely to find yourself clicking from site to site acquiring nuggets of knowledge in a kind of web search marathon that often leads to a digitally induced coma. Don’t get me wrong, the Internet has a lot to offer, and I especially recommend seeking out some of the excellent video resources like Khan Academy or Mark Bishop’s An Introduction to Chemistry. You just have to know what you’re looking for and have the time, patience, and web browsing savvy to find it without getting frustrated and deciding to check in on Facebook instead. 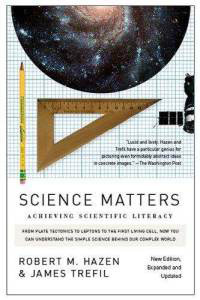 Science Matters is a rare exception-a science book for the general reader that is informative enough to be a popular textbook for introductory courses in high school and college, and yet well-written enough to appeal to general readers uncomfortable with scientific jargon and complicated mathematics. And now, revised and expanded for the first time in nearly two decades, it is up-to-date, so that readers can enjoy Hazen and Trefil’s refreshingly accessible explanations of the most recent developments in science, from particle physics to biotechnology. So there you have it. Some of my suggestions for learning about the scientific concepts that you need to know in order to have an informed opinion about the many important, science-related issues that affect you, your family, and your world. Happy reading!